Erosion is when small pieces of rock are transported from one place to another by the elements, for example by wind and water. Then the pieces are deposited into a lake, stream bed and or on beaches. These are only a few of the places where they can be deposited. Alluvial Fans are one example of the effects of erosion. They are made when streams flow down a mountain and then deposit sediment at the base of the hill in a fan like shape display. Now my favorite type of erosion to study is the ox-bow lake type. It first starts out as a river that has a bend in it. 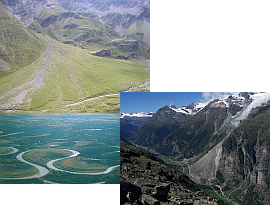 These types of rivers are called meanders. At the base of the river the water erodes away the bank wall until it gets to the other part of its own channel. When the lower part of the meander is cut off it makes a C shape lake which is called an ox-bow lake. Join in and write your own page! It's easy to do. How? Simply click here to return to My Homeschool Joshua.